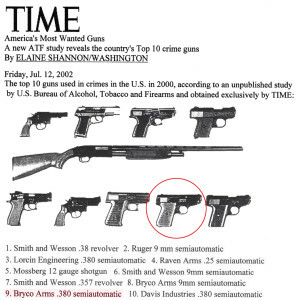 The government’s list, revealed to the public for the first time in July, 2002, by TIME magazine, of the Top Ten Crime Guns, which included the Bryco .380. Brandon’s attorney would be the first to discover the gun’s defect only three months later, and that Bryco’s owner knew of the defect and had put the gun on the market anyway. This entry was posted in Uncategorized on February 6, 2016 by Mike. Click here for Move To Fire on Amazon. It’s a slow rollout, and it may be buried under the plethora of books heavily promoted as gifts for the holidays, but, hell, it took almost eleven years to get it here, so a slow rollout, while occasionally frustrating, almost seems appropriate. I’ll add more bookseller links as distribution expands, and I’ll also use this site to share much about this next phase of the process: reviews, reactions, promo and publicity, etc. Due to the subject matter — lawyers, guns, and money — I’ll heavily moderate all posts and comments. I’ll allow the full range of viewpoints, but I will also not allow the kind of base, crude, and aberrant type of comments that are always shared (yep, always) by those who have an established, unwavering position on guns, gun violence, gun regulation, and the Second Amendment. The vitriol written by trolls from the safety of their hovels can be repugnant in ways decent folk can’t imagine, as is documented in Move To Fire. I also look forward to hearing from those who want to explore fact vs myth, accuracy vs rumor, and… you get the point, I’m sure. Talk to me, tell your friends about this, and no matter what side of America’s guns issue you’re on, recommend this book to every woman, man, and young adult. Obviously, I have to do what I can to succeed commercially, but I have always felt that the Move To Fire story will assist people in their efforts, in OUR efforts, to establish a DMZ of reason and awareness as we work toward a solution to America’s gun problem… because there IS a problem, and one of Move To Fire’s attributes is the underlying lessons of how to find solutions and create change. Move To Fire – A family’s tragedy, a lone attorney, and a teenager’s victory over a corrupt gunmaker. This entry was posted in family, guns, law, regulation, society on November 16, 2015 by Mike.